Hi readers, I’m on a spree at the moment I couldn’t find the muster to restart late last year and now ideas  just keep popping up just like Collections within the Collectibulldogs collection, an article that shows either sets or larger numbers of the same piece which in essence would be Collections within the Collectibulldogs collection. Its easy when surrounded by whst you have to create the content as there is so much to write about and to add Collections within the collection is quite easy as I can see most of them and can also remember by heart  what I have here, from the three Karl Tutter pieces to woody barklots and his precious wooden family with pups. 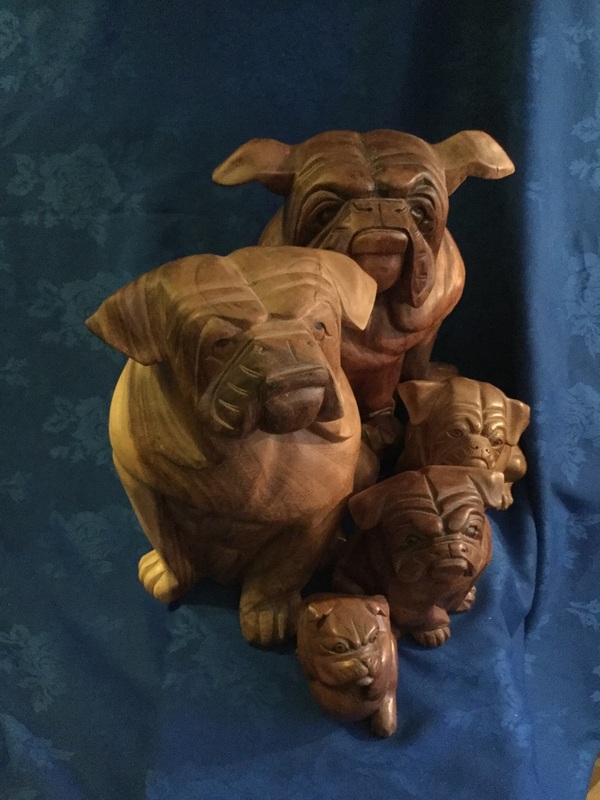 together they are very photogenic and even though one of the smallest collections within the Collectibulldogs collection you have to admit they do have a sense of charm as the whole salvia wood were used to make some and the others I’m guessing are an Indonesian native wood, I’m not sure if they are carved for the tourist trade or actually made for export. 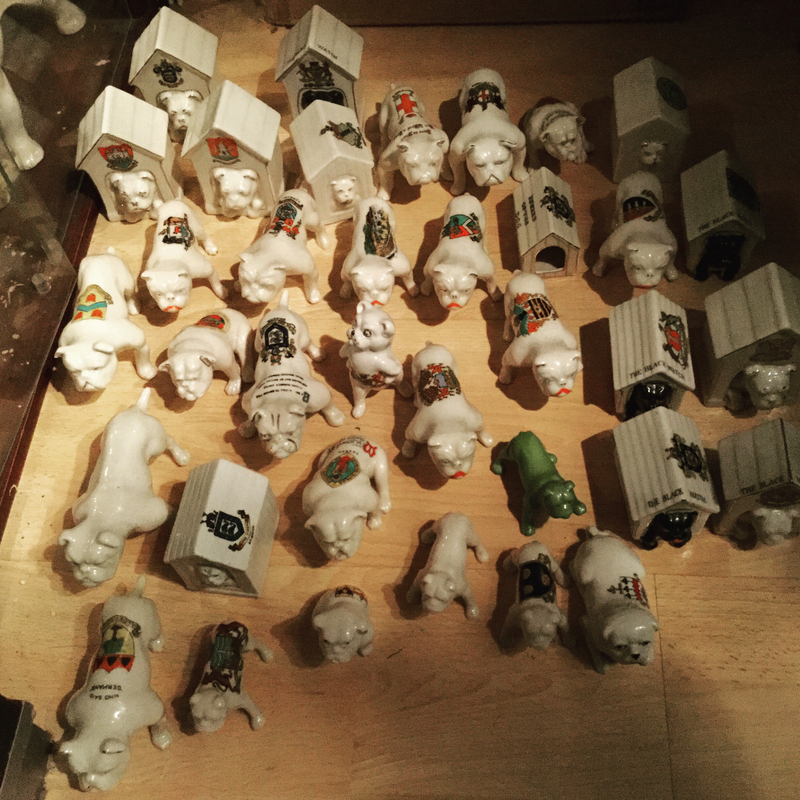 In my experience the idea of collections within the Collectibulldogs collection is more than 3-5 pieces ! the reason I say this is becouse some collections are what you’d consider as small, the huebach set consists of about eight seated pieces and three standing ones, together they look amazing together and I believe it’s the huebach seated pieces that had me realise there’s sometimes more than three in a set. 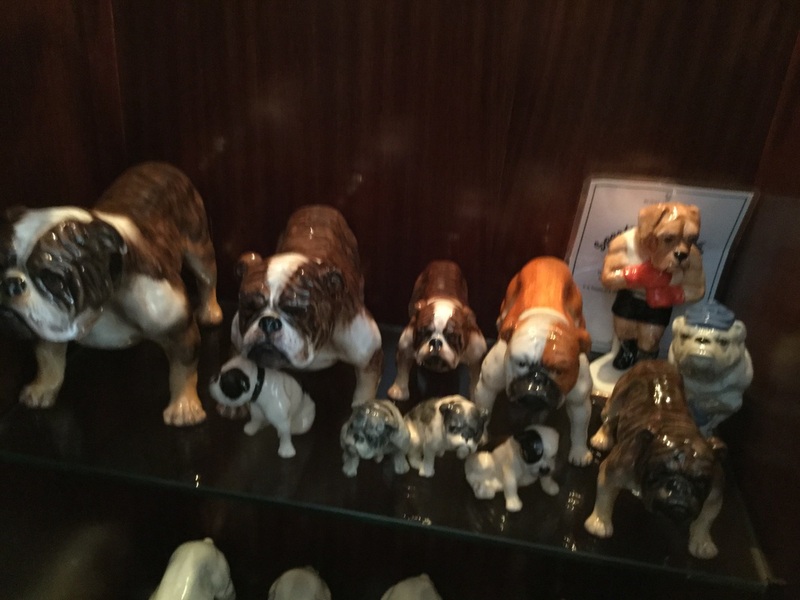 Unlike Royal Doulton Bulldog pottery where the standing bulldog has a different facial look to its seated counterpart huebach have stayed with the same models face on both standing and seated, I’d love to find an even smaller version and I wonder why so many in so many different sizes where were they sold and whom too ? 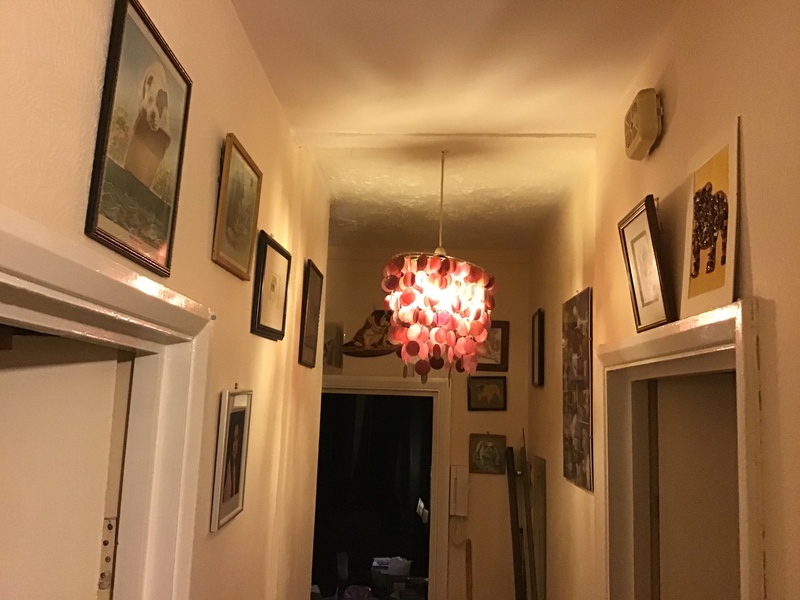 Imagine walking into your local pottery dealers and say have you got the third from smallest huebach at all , I believe I have them all size wise now. 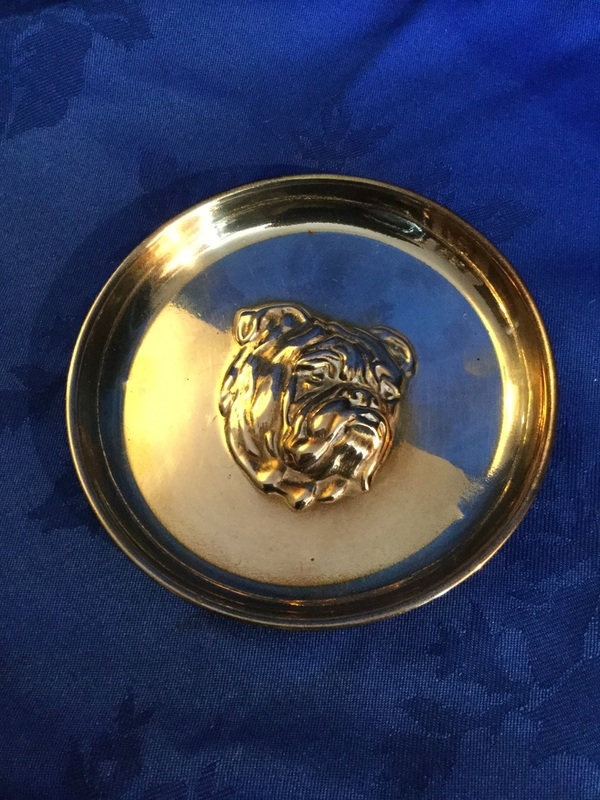 Out of all our Collections within the collection the Crested ware is the first or second largest that we have here there’s different sizes standing and seated there’s the kennels with bulldog faces in and the rarer black watch pieces,Goss is the name to look out for underneath they are the most collectible but if you check each bulldogs saddle (Back) you’ll see different crests. Most of the crests are of english towns and cities, I’ve collected Brighton my home town and it took a while to find them, crested ware is a brilliant place for a novice collector to start with as a niche not only are they collectible but you don’t have to be a bulldog collector these are so plentiful they are of all kinds of different objects like a boot, vases of various sizes, even tiny jugs but as I write this and recall days out to car boot sales I cannot recollect seeing these as different animals. 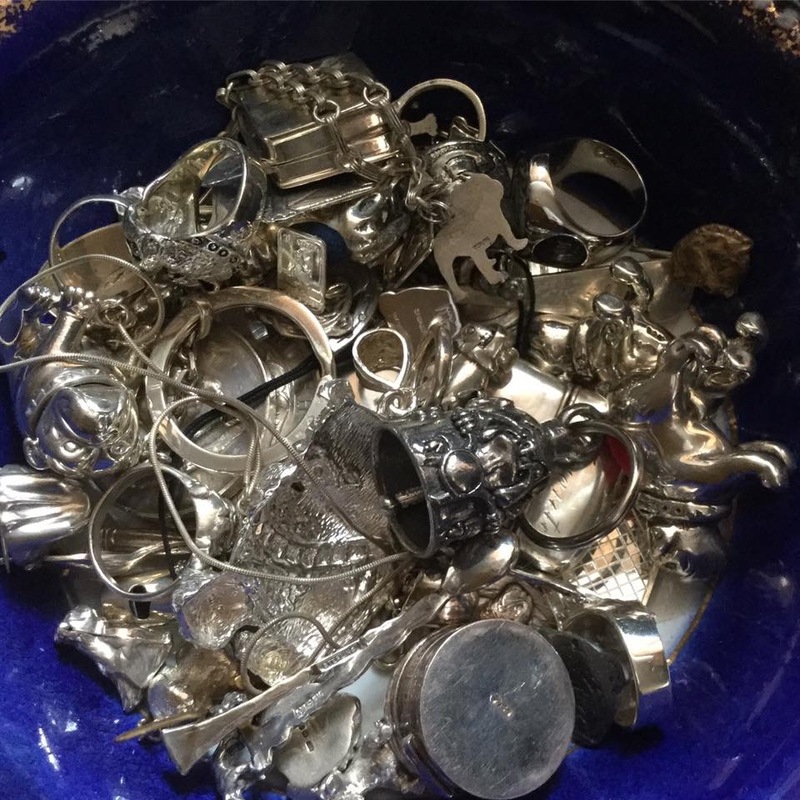 The silver isn’t even Collections within the collection there’s so much I’ll just classify it all together, a few years ago I remember thinking to myself that I did not have much in the way of silver I had silver plated spoons and a few charms but it was not until about four years back I got our very first bulldog statue made from silver, it cost me the earth at the time but the feeling of accomplishment was worth it. 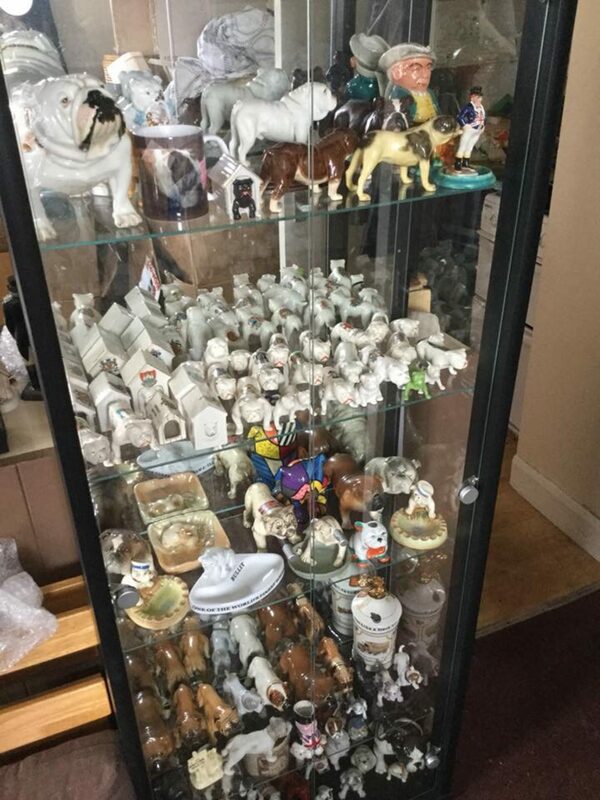 As with glass loss I had a weakness to silver and started saving as much as possible whilst wasting money on some modern pieces along the way, figurines jewelleries of different kinds,Trophies Medals Flatware (cutlery) coins and other miscellaneous silver goodies that take up a whole cabinet now, there’s doubt that Collectibulldogs will not be able to obtain any silver pieces this year we are looking for club pieces but my marriage last year and my motorcycle mean my budget has shrunk, so that’s polishing the silver on a Saturday now and washing my bike Sunday’s lol. 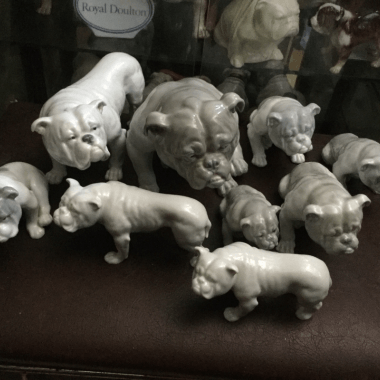 I had to think before adding the Royal Doulton Bulldog collection is it under Collections within the collection and as there’s collectors out there that just collect this make I see it as a collection partly becouse we are so proud to have found so many, Royal Doulton Bulldog still seems to be one of the most used keywords on search engines. 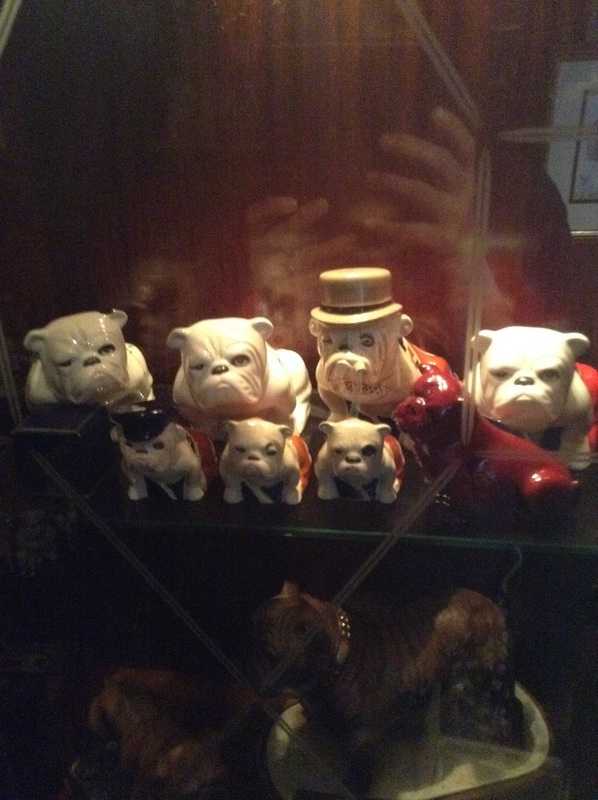 Embedded Into the collection are the Royal Doulton trademark sets of three and we have approximately five sets with three being the standing, the pure white the brindle and the brindle and white the standing bulldog was modelled on a champion but I’m yet to do the research, this make has many budgets for all wallets it just depends what you want to collect they did create over fourteen hundred different animals but also made old bed warmers bottles, they started out making sewer piping so the only way was up really. 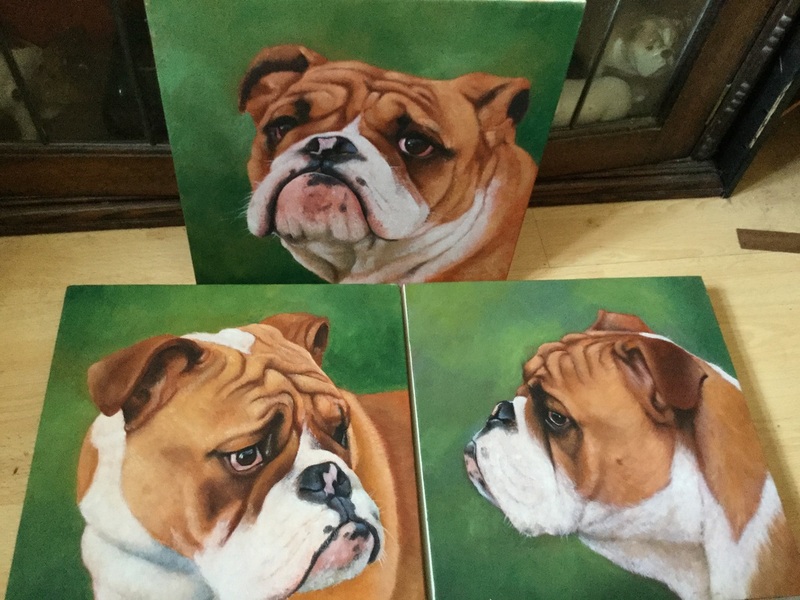 with over one hundred paintings and top quality pencil and pastel bulldog portraits or artistic work why not add artworks to the list of Collections within the collection my hallway is full of art it goes through the apartment and stops at the front room door, I felt debbie would like that space for family pics and new framed prints of our wedding. Some i I know of and others would need research but there hadn’t been much call to do any arty type blog articles and to be honest with books art is one of my collecting Achilles heels you can ask me most things but books and art I’m poor with my knowledge yet I can count so hence why my artworks made the list, vintage bulldog artworks would save you money but there’s many an artist around today just waiting to paint your pooch please get in touch for some verified artists we know ! 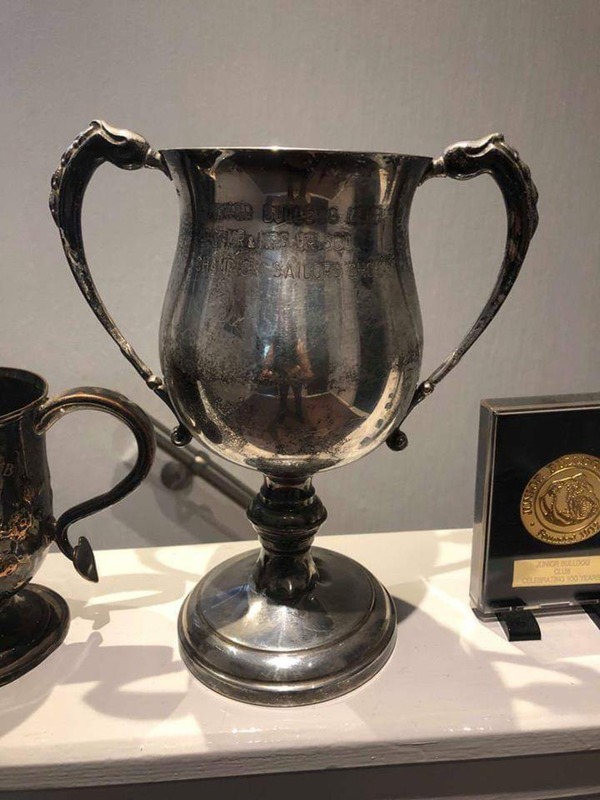 Ashtray was seen as a dirty word in its own right over fifteen to twenty years ago unless it was an ashtray but had provenance the auction houses decided the outdated objects they are trying to sell should have a cleaner name so Bon Bon dish,PinDish and even key trays replaced the word ashtray so we have a nice sized collection of pin dishes. Quirky to the exquisite with these pin dishes it could be quite easy to forget they were once made for ash unless completely obvious some of them do look to good to have cigarettes stubbed out on them (Collectibulldogs thinks smoking is Dangerous please do not start ever ) many vintage and antiques have been re named or repurposed so that they can get sold remember we live in a WiFi age you have to be of a that kind of person to want to buy something that others may see as old and useless. 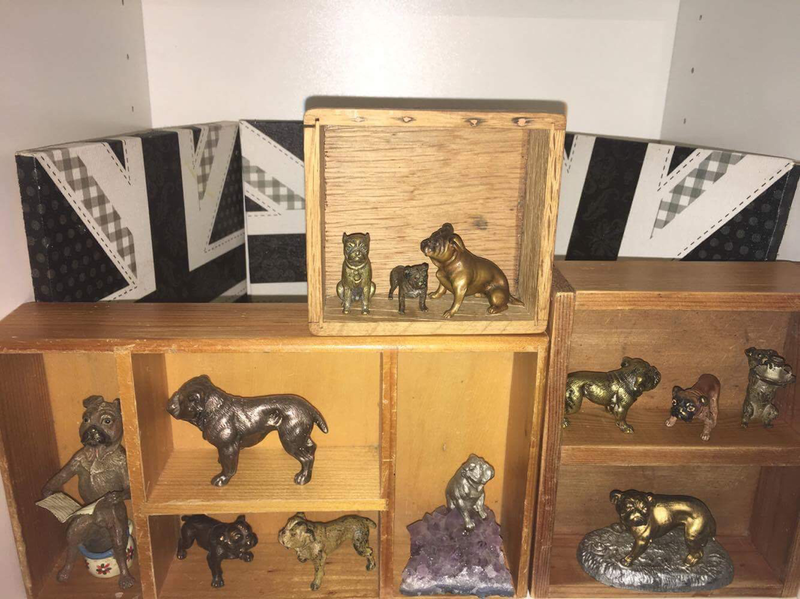 Collections within the Collectibulldogs collection The tiny ones ! 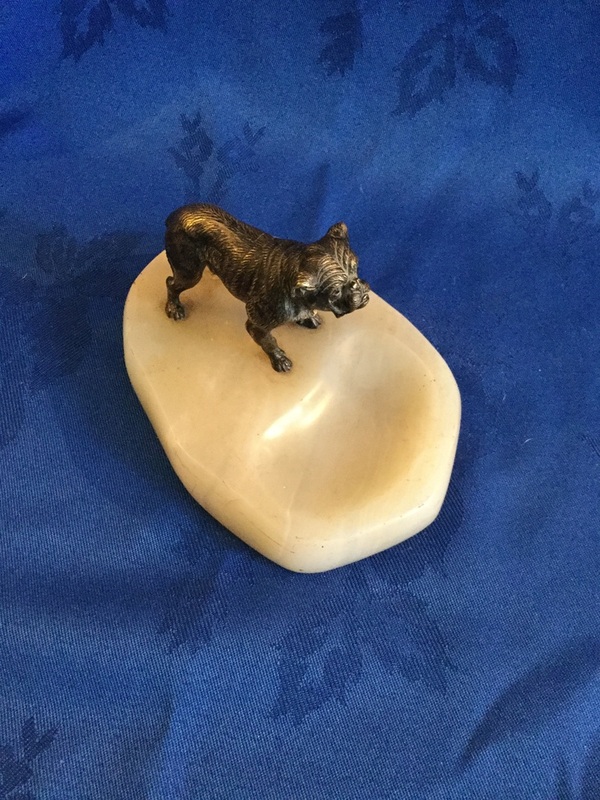 One of the Collections within the Collectibulldogs collection is completely metal and not from the silver pieces, we have the Bendy BookShelf as it’s called here and among the larger pieces are hundreds of tiny bulldog figurines some are cheap metal and others are of origins like Austria and other European countries, post war Germany and America both excelled in mold making and the objects made were clearer than ever. From pewter to bronze and various other metals these tiny little pieces sit proudly in little groups, I thought I lost one a while back and went bonkers for a while (I feel it when it comes to the pieces) the cat had hidden the piece in a shoe and it took ages to find it, cats mysterious mischievous and naughty yet have cute faces plus they don’t care do they cats can be worse than dogs for attention. 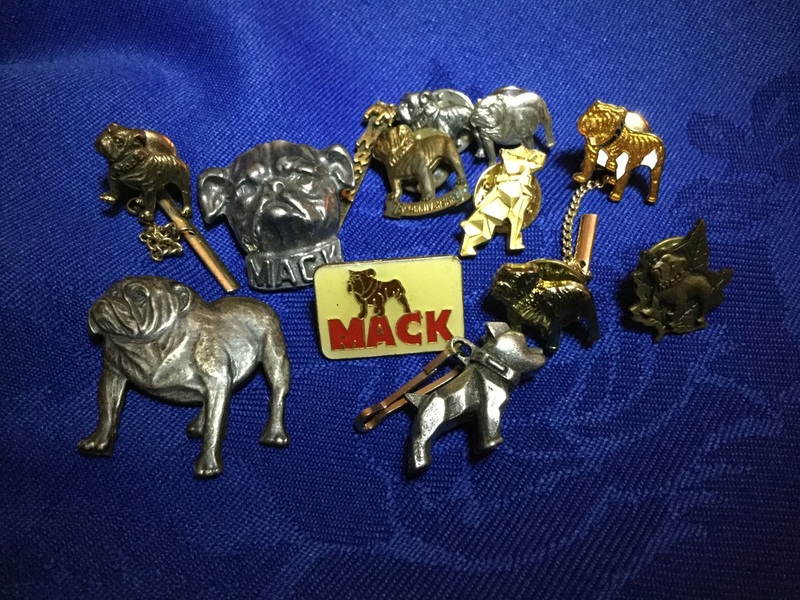 As the emblem of the company Mack Truck had commissioned in 1956 and modelled as a piece and painted Mack the Dog was a brindle picked from a selection of bulldogs of the time to be the commercial face of Mack trucks, the pieces we have means Mack truck makes Collections within the Collectibulldogs collection, from owning five hood emblems we have a Palestra of other Mack truck paraphernalia from lighters to the world famous tie pins. 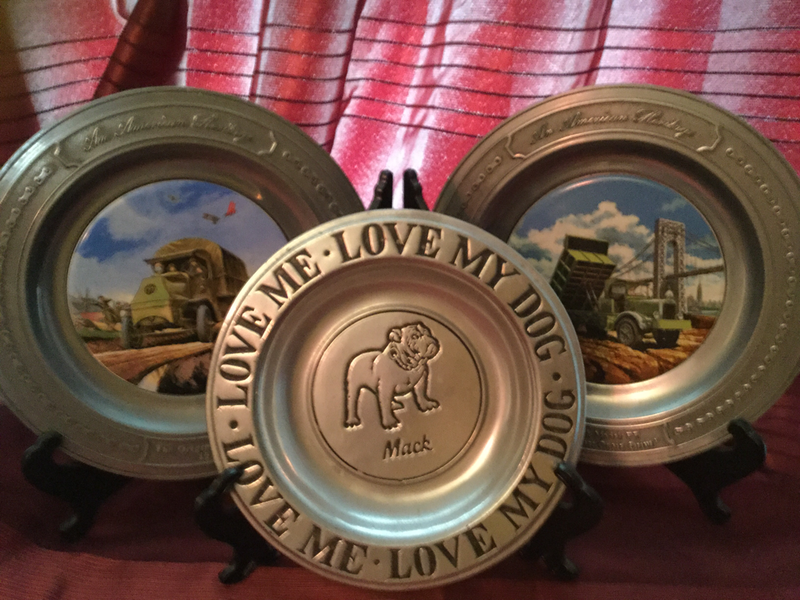 Most of the pride for this Collections within the Collectibulldogs collection has to be the plates I’ve found there’s seven in all and six are pewter with a ceramic middle, to find the set is fantastic and yes I’m left wondering if there is more than six ever made I’ve checked but so far no luck, Mack truck is one of our largest of Collections within the Collectibulldogs collection so see if you can spot many in our galleries, keep safe and happy collecting!